I created the following image a few months ago, following the Visual Thinking seminar I attended, and kept meaning to post it here but kept forgetting to. 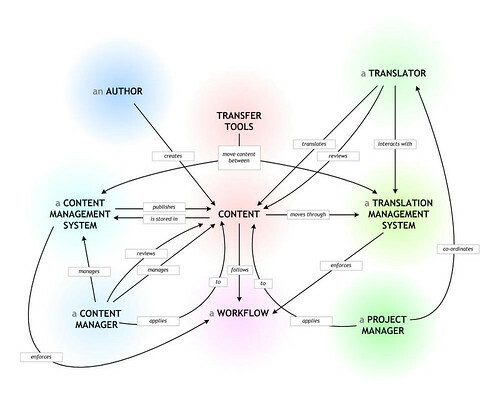 It’s an attempt at capturing the major elements, or “Nodes”, involved in translating content. There’s a couple of omissions such as Translation Memory but I was trying to keep this a little higher level and avoided some of the CAT tools etc. The lines between each node represent a relationship (“link”) between the nodes. I’d be keen to hear comments or suggestions you might have – for a bigger view click the image to view the Flickr page for the picture.